Since moving 550 miles away from our home last year, we’ve decided to start to learn more about new cultures. Recently, I learned about the Mexican culture and especially the holiday celebrated, Dia De Los Muertos, Day of the Dead. I found pictures of the “sugar skull” online and was intrigued by how elaborate and detailed these are. I talked with a friend I work with, who is Mexican, to learn more about the festival/holiday. He told me that it is a really fun, happy time; a day to celebrate the lives of those we’ve lost. 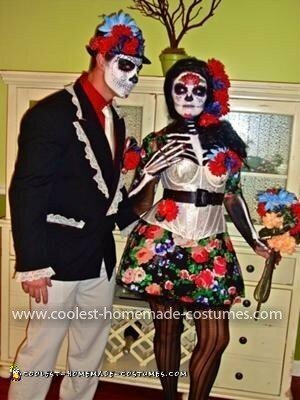 I wanted to honor this culture and have fun making a Halloween costume, so we decided to be sugar skulls for Halloween! I started the idea with an old ill-fitting dress with an amazing floral pattern. I designed my costume with a little nip and tuck of the dress, and added a corset to it. I made the petticoat out of tulle that I bought at Jo-Ann fabrics. 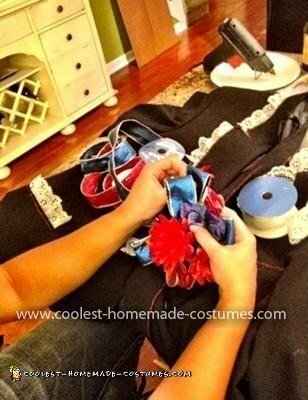 A good petticoat from the costume store can cost almost $50! I think I spent about $5 on tulle and the material I sewed together to make the actual skirt. I went to one of the craft stores in my area and picked up some of their sale floral arrangements. I plucked the flowers from the bunch and arranged them in a few fashions to accent the top. I bought a $5 black wig from Wal Mart and tied the hair over to the side. I made a flower schrunchi out of a black hair tie and some of the flowers. I then added the flowers to my hair with bobby pins. I found an old belt and tied it around the waist, and bought a pair of tights. We went to the Salvation Army and Goodwill and were able to pick up the suit jacket. We also found the tie there. These places are excellent to shop at for Halloween. You can find great, unique pieces at amazing prices while supporting a good cause. We then found a plain, black cotton hat for $6.99. I added flowers to the hat and made a sash with some funky Christmas ribbon I had laying around. For the jacket, I made the boutonniere out of the flowers and ribbon and just safety-pinned it to the jacket. I am far from professional, but after playing around with the flowers long enough, you kind of get the hang of it. I bought some $1 glitter glue from the craft store and decorated the trim of the jacket, and then added lace which I also got for a buck at the craft store. 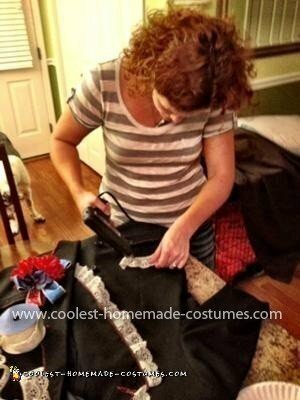 I just hot glued the lace trim into the jacket because it is was easier to do this than to sew it! We had a few trial runs. I saw some pictures on google for ideas. I have done some cream makeup in the past, but this year I ended up buying a translucent setting powder. This seemed to be the key in getting the makeup to set before trying to apply another layer. The makeup can be pretty difficult, but with practice it gets easier. I did all of the makeup, people kept asking if I painted him and he painted me. Nope, just used a mirror and a good light. I looked up pictures of a skeleton to see how finger joints and chest bones are put together, since these were all painted on as well. They were kind of messy. Overall, these costumes had a lot of thought put into them. Not only are the costumes unique and original, but they have meaning. As you can tell, they were also created on a budget and used mainly “recycled” materials! Thanks for considering our costumes. 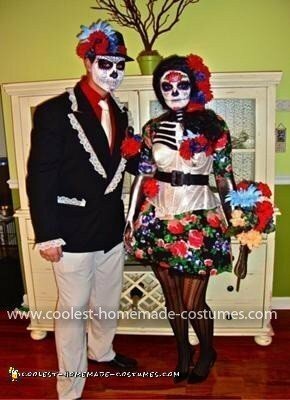 These costumes are the best I’ve seen… I keep seeing everyone post pictures but nothing tops this! Love the idea and the artistic elements that you used. Very creative, original, and awesome! Love it!!!! I am so jealous of your creativity! Your costumes rocked! I was thoroughly impressed with the design and thought you put into it! Way to go!!!! Well done, Mara. Clearly a lot of thought and effort put into this. Can’t say that I’m surprised! Again, great job you two! So creative, elaborate, and ORIGINAL!